I only know this one 45 by this rather obscure group. 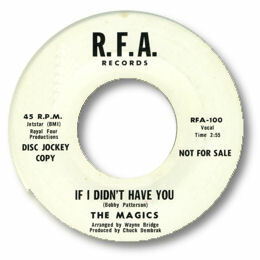 If I Didn’t Have You is a version of a song Bobby Patterson wrote and recorded on Jetstar 107 in 1967 so I guess this record must have been cut around that time. The lead singer does a fine job, particularly towards the end of the song when he injects some passion, and doesn’t make you wish it was Bobby at the mike – no mean achievement. The horns are better arranged than the Jetstar as well. The occasional phrase from the vocalist and the guitar break in the middle make me wonder if this is one of those self contained white groups who played some R & B. Thanks to Hans Diepstraten for the new info.